Check in to 4-star comfort at Novotel Wollongong Northbeach hotel right opposite the surf-patrolled beach. Your welcoming modern room's panorama windows make the most of superb sea and mountain views. A surf or a beachfront jog and a delicious buffet breakfast with a Pacific Ocean backdrop get your day off to a sunny start at Novotel. Featuring a superb location, Novotel Wollongong Northbeach provides an excellent base for guests who want to explore the best of Wollongong. The hotel is within easy reach of Wollongong's many restaurants, bars and shops, its attractions and its beaches. Featuring a range of superb accommodation options, Novotel Wollongong Northbeach is ideally placed to offer the perfect beachside break or conference destination. 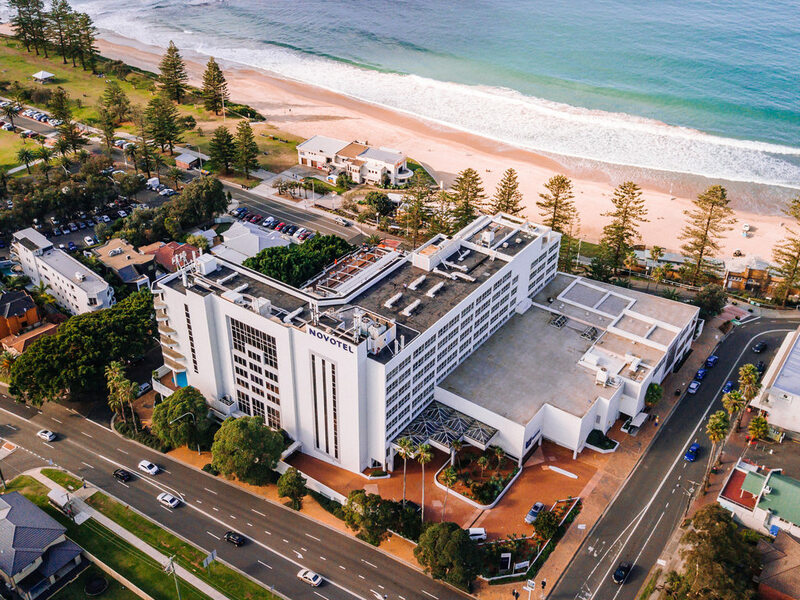 This impressive Wollongong hotel features 204 tastefully appointed guest rooms and suites, w ith Superior options offering ocean views and private balconies. Each room features everything needed for a relaxing stay, including a flat-screen TV with Austar and pay-per-view channels, an iPod dock, WIFI access, a spacious work station and a minibar. Windjammer's reputation boasts an extensive a-la-carte and buffet menu, seven days a week for breakfast and dinner. A Seafood Extravaganza is offered Friday and Saturday nights. Overlooking the Pacific Ocean. Indoor and outdoor dining are offered. A relaxed atmosphere perfect for any occasion. Offering an extensive beverage menu, cocktails, coffee and cake. Table service is offered. Live entertainment is provided on Friday and Saturday nights only. PEPE'S on the beach promises a slice of the Mediterranean with a hint of Bondi on the shores of North Wollongong Beach. PEPE'S offers all-day drinks and dining with al fresco options on their large scale deck and private cabanas.